Director Veemsen Lama and screenwriter Sampada Malla’s thirty minute short (the pre-premiere, work in progress cut of which I was sent via email and base this review upon), “Chyanti” (2016), concludes with the resonant lyric: “It is the hopes that keep us alive.” This is a perfect reiteration of the overall theme of this subtle, emotionally honest and undeniably human work. Such is most perceptible in our protagonist, Ram (in an enactment by Shyam Khadka that is every bit as credible, mature and understated as Lama’s endeavor itself). He is a man who, despite the hardships placed before him, regularly reassures his wife, attributed here simply with the designation of “Mother” (an incredible, alternately wounded and strong portrayal by Babita Tamang) that their personal situation will get better next year. This is when Ram believes the regulatory landscape surrounding his kin will greatly alter in their favor. It is this idealism amid grueling circumstances which helped make Lama’s prior masterpiece, “Maya” (2015), so endlessly relatable. The consequence of that sixteen minute affair was a harrowing reminder of the transcendence of pure cinema. It also helped make us care all the more for those Lama centered his narrative around. Such also made the overall experience gripping, heart-breaking and soul-stirring. We felt the disappointment of every low-point. In addition, our cores radiated with joy when fate appeared to be favoring the leads. The same is true of “Chyanti”. In many ways, Lama’s latest can be seen as a companion, especially in tone and in contemplation of the many of the subjects addressed, to “Maya”. This is especially accurate when noting the humanity that courses grandly through every frame of both productions. This is largely thanks to Lama’s aesthetically breathtaking, yet remarkably intimate, behind the camera influence. It is also as much courtesy of an ingenious and genuine script that, much like the aforementioned chronicle, never wavers from its character-oriented emphasis. Malla’s penned construction, from an inspired by factual occurrences story that is credited to Lama himself, is confidently, smartly paced. It rings with authentic dialogue, proceedings and is graced with a highly unpredictable story arc. 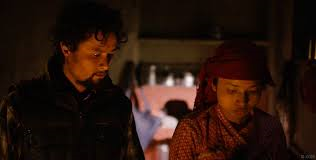 Also akin to “Maya”, Lama and Malla successfully offers charismatic, yet flawed, down to earth heroes and heroines. All of which are spectacularly realized and cut from the everyday. They are undoubtedly a representation of the reality Lama is obviously striving for throughout this stupendous exertion. Such makes the manufacture as a whole increasingly vivid, tear-jerking and entrancing. Lama’s tale takes place during The Maoist Revolution. A commencing title card informs the viewer that such an event transpired in the South Asian country of Nepal. This was in the years spanning from 1996-2006. We also learn that this was a civil war. It was one involving the Nepalese government and the Maoist Communist Party. Such a combat left many homeless and took the lives of thousands of individuals. After a minute and a half of beautifully shot arrangements, all of which follow Ram coming home for the festival of Dashain, we witness firsthand the desperate financial situation his flesh and blood find themselves in. A distressing line of dialogue between Ram and Mother tells us that their daughter, Sani (in an exceptional depiction by Sangita Tamang), is about to begin school. Yet, Mother is unable to afford the food for dinner that night. Because of matters such as these, she cannot attain any of the niceties that the other children involved with Sani’s education faculty will be enjoying. This is when Ram and Mother look to selling Sani’s beloved goat, whose name is that of the configuration, to relieve some of this fiscal anxiety. Most of Lama’s undertaking revolves around the manner in which to do this without Sani becoming aware of what is really going on. This heads to an expertly done, sentimentally taxing sequence at twenty-five minutes in. At this point, we see the results of this difficult decision. This is through Sani’s innocent eyes. Such creates a mesmerizing conclusion to a brief photoplay where the word “unforgettable” certainly applies. Lama peers unafraid to inquire endlessly into complex issues of morality with this riveting endeavor. But, the cornerstone is Lama’s unflinching glimpses into what one man would do to provide for his loved ones. Such focus only heightens the quietly contemplative nature unveiled herein. It captivates us with its daring sensibilities. Lama has, in turn, provided an impeccable blend of intelligence, craftsmanship and sincerity. These are all ingredients Lama fluently distributes to his spectators. What is all the more amazing is that the opus doesn’t weigh itself down in the political aspects of the undertaking. “Chyanti” is just as dazzling from a technical angle. Ben Winwood musically evokes the low-key demeanor of the presentation. This is with often gentle, but always ear-pleasing and appropriate, orchestration. Arran Green delivers gorgeous cinematography. Uhjwal Dhakal and Eriks Mickevics’ editing is terrific. Michael Ling’s sound is sharp and impressive. Babita Tamang, Khadka and Malla’s costume design is superb. Kaushal Pandit is tremendous. He leaves a lasting imprint with his short-lived turn as a goat seller. Ben Allinson’s visual effects fare just as wondrously. These meticulously erected elements all come together both seamlessly and authentically. The Javiya Films and 360 Degree Mountain Films release is another confirmation of Lama’s intense talent. His knack for optical storytelling is ever-abundant. The effort is luminously framed throughout. This is in a fashion which infinitely amplifies the exquisiteness at hand. We see this in the jaw-dropping lensing of the natural surroundings of the account. Such is also accurate of the allure inherent in the various layers of the saga itself. This is an astonishingly accomplished demonstration. It is one of the increasingly rare creations that satisfies on all levels. Lama has amended a triumph of invention and honesty. “Chyanti” will undoubtedly please wide-audiences. It just as assuredly continues to establish him as a modern major of the moving picture art form. Because of the sheer magnitude of these achievements, “Chyanti” easily stands among the best featurettes of the year! *All pictures included herein are the copyright of Javiya Films.